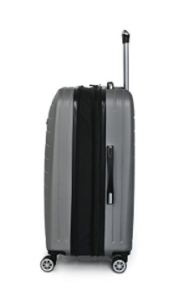 IT Luggage Legion (16-217908-UOL3N) is a set of three pieces of hard side expandable spinner suitcases with eight wheels. It has a simple yet beautiful and elegant design and is offered with a choice of six beautiful colors: Black, dark grey, dark wine, aluminum white, gold and blue depths. The price tag is the same for the first three colors and about sixty percent more for the last two colors on the day of this review. 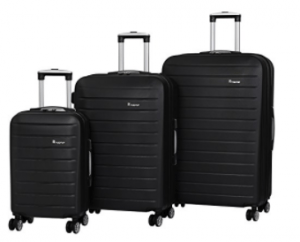 The suitcases in the set are made of robust yet lightweight ABS plastic material with polyester lining. You’ll gain an extra twenty-five percent of interior space when you unzip the zipper in the middle. And you can fit in more of your stuff but the small carry-on bag may go over certain airlines’ cabin bag size allowance this way. The sturdy 8-wheel easy-glide system offers you superior wheel control and allows you to maneuver the bags easily and smoothly in all directions and in narrow spaces. You have the comfortable soft touch gel handles on the side and the top and a robust chrome telescoping handle with a comfy grip that locks at different points and gives you maximum control. With a nice clamshell design, you can pack, secure and organize your belongings easily as the suitcases are opened through the center and offer an optimal flat surface for packing. You’ll find a zippered divider in the center for keeping your stuff separate as well as the zippered mesh pockets, two slip pockets, and two tie-down straps. The largest suitcase in the set weighs 10.7 pounds and measures 31.7 x 21.9 x 13.6 inches with an extra 3 inches as expanded. The medium suitcase weighs 9.15 pounds with the measurements of 28 x 19.3 x 12.2 inches plus the 3 inches as expanded. These two are too big for use as cabin luggage, the medium needs to be checked in at the counter before your flight and the largest may be a bit too big for some airlines and you may need to pay an extra fee. The smallest carry-on bag weighs 6.38 pounds and measures 21.5 x 14 x 9 inches + the 2.5 inches of expansion. These dimensions include the wheels and the sizes and the weights are bigger than normal due to heavy-duty hard shell build and THEY offer you larger storage capacity. They can be nested into each other and this is how they are shipped and how you can also store at home, especially if you don’t have a lot of extra space. Please note that the contents will be visible through the packaging unless you select “Hide Package” when you check out. The bags can take a big amount of beating and abuse without any damage and they’re easy to clean. To sum up, the set is functional, versatile and durable with a premium look and feel and a reasonable price tag for what you’re getting and offer great value for money. This is a very good quality set that comes with a long warranty of ten years by the manufacturer- it Luggage as a proof of its quality and durability.